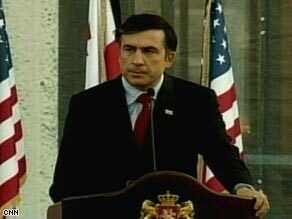 TBILISI, Georgia (CNN) -- A grim Georgian President Mikheil Saakashvili said Friday that he signed a cease-fire agreement that requires the immediate withdrawal of all Russian forces from Georgian soil. Georgia President Mikheil Saakashvili announces Friday he signed a cease-fire agreement with Russia. The agreement includes a provision for independent monitors and an eventual reconstruction plan for Georgia's economy, said U.S. Secretary of State Condoleezza Rice, who brought the documents to Tbilisi, Georgia's capital. The two met for almost five hours, the Georgian president said. Later Friday, the office of French President Nicolas Sarkozy, who brokered the agreement, said Russian President Dmitry Medvedev had confirmed Russia's cooperation. Saakashvili opened a news conference announcing the agreement with a bitter tirade against what he characterized as European nations' appeasement in advance of a Russian invasion last week. NATO's decision in April not to admit Georgia as a member encouraged Russia to build up forces and attack Georgia with impunity, he said. "Who invited the trouble here?" he asked. "Who invited this arrogance here? Who invited the innocent deaths here? Not only those people who perpetrated this are responsible, but also those people who failed to stop it." Georgia last week launched a military incursion into South Ossetia to rout separatist rebels. Russia, which supports the separatists, responded the next day, sending tanks across the border into South Ossetia. The conflict quickly spread to other parts of Georgia and to Abkhazia, another breakaway region. "We support Georgia's sovereignty; we support its independence; we support its territorial integrity; we support its democracy and its democratically elected government," Rice said. She said an independent monitoring force must be put in place as soon as possible and that talks were under way to assemble one. "Never, ever will Georgia reconcile with the occupation of even one square kilometer of its sovereign territory," Saakashvili said. Saakashvili had hesitated Thursday evening when asked whether he was ready to sign the cease-fire papers Rice was carrying. "We'll have to see what she has to bring," Saakashvili said on CNN's "Larry King Live." "We are still in the negotiating process." In Washington, President Bush chided Russia on Friday for Cold War-style behavior, saying, "bullying and intimidation are not acceptable ways to conduct foreign policy in the 21st century." Bush said the United States stands "with the people of Georgia and their democratically elected government." He said the country's sovereignty and territorial integrity "must be respected." "We will not cast them aside," he said. Bush said Russia's invasion of Georgia has "damaged its credibility." Bush said he has been receiving updates from his national security team about the situation. Bush said Rice would travel to his ranch near Crawford, Texas, where the two will confer. He said Defense Secretary Robert Gates is briefing him on humanitarian assistance and that he is working closely with "our partners in Europe and other members of the G-7 to bring a resolution to this crisis." Administration officials said this week the United States and its allies were considering kicking Russia out of the Group of Eight, the group of the world's most important international economies, as punishment for its actions in Georgia. "Moscow must honor its commitment to withdraw its invading forces from all Georgian territory," Bush said. He said Georgia has been part "of an inspiring and hopeful new chapter in Europe's history," and he noted that Europe "has moved beyond" the world wars and the Cold War, the standoff between Soviet-style communism and the West. iReport.com: Did you experience the Cold War? "Unfortunately, Russia has tended to view the expansion of freedom and democracy as a threat to its interests," Bush said. "The opposite is true. Free and prosperous societies on Russia's borders will advance Russia's interests by serving as sources of stability and economic opportunity." The United States is hopeful that Russia will embrace "a future of cooperation and peace" that would help all parties, he said. "The Cold War is over," Bush said. "The days of satellite states and spheres of influence are behind us. A contentious relationship with Russia is not in America's interest. And a contentious relationship with America is not in Russia's interests." CNN's Elise Labott and Zain Vergee contributed to this report.